By buying this product you can collect up to 1229 points . Your cart will total 1229 points that can be converted into a voucher of ₱1,229 . GIGABYTE leads the industry by collaborating with Intel® - the world renowned tech giant. This time round, the AORUS uses a combination of high-performance parts by Intel®, called the All Intel® Inside technology. Expect a brand new multitasking-expert 6 core Intel® CPU, durable and ultra-fast 760p SSD and Intel® based killer Wi-Fi for smarter broadband connectivity. All these high-performance parts work together seamlessly, so that you can concentrate on more important tasks at hand. When the world is hyped about AI, you as an individual should ask and think what AI can really do for you. GIGABYTE went a step further by adapting the perspective and experiences of our users and cooperate with Microsoft Azure to bring you the world’s first AI laptop - the AORUS 15. User preference data passes through the Microsoft Azure Machine Learning platform in order to dynamically determine the best CPU and GPU wattage setting for optimal gaming performance and shortest media processing times possible. Users will experience absolute smoothness without hassle whether it is for gaming or content creation. The next upgrade is here, introducing the all new Intel® Core™ i7-8750H . Moving up from the previous Kaby Lake architecture CPU’s, the all new Coffee Lake architecture increases the performance with a whopping additional 50% in multitasking performance, with better energy efficiency and processing power that lets you steam, record and play at the same time without worries. The wait is over. Introducing the Intel® Core™ i7-8750H with AORUS 15. The greatest meets the greatest. AORUS continues its powerfully effective cooling system for light and thin high-end gaming laptops. The new generation AORUS 15 take it to the next level by designing 50% of the base surface area as vent intakes, in addition with 6 specially designed heatpipes, 9 vents and dual powerful fans. All these parts works together to dissipate the heat generated by the CPU and GPU in order to create the coolest and stable performance gaming laptop by AORUS. From the AORUS research center comes a breakthrough of high performance in a thin and light chassis. With exclusive heat dissipating technology working in a chassis that is no thicker than 2.5 cm, with distinctive design cues that comes from the wings of a modern fighter jet. The AORUS 15 is in its top form to provide you with nothing but victory. 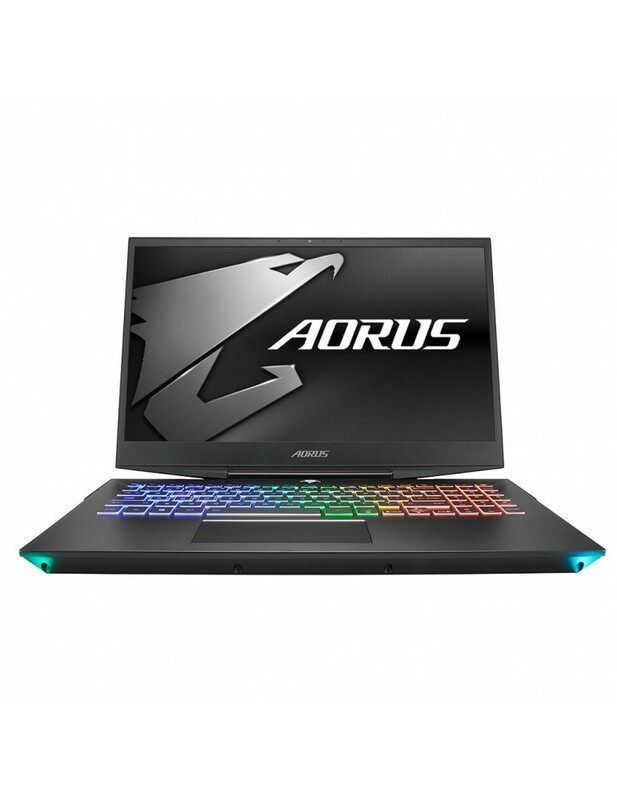 This Marks the first AORUS gaming laptop with a thin-bezel display design, pushing the boundary of technology by having a 15.6 inch display in a portable 14 inch like chassis. AORUS breaks the gaming laptop tradition by offering portability where others can’t. NAHIMIC top-end software built brings a tremendous improvement to 3D 7.1 surround sound experience. The advantage is clear, with pin point accuracy, NAHIMIC provides gamers the ability to hear the surrounding with true accuracy and definition without distortion. Feel the gaming environment through the headphone and take the victory. AORUS 15 keyboard takes on a fresh look with stunning 16.7 million color per-zone RGB lighting to create what is uniquely yours.